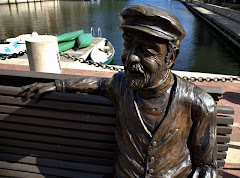 Restonian: News blog from Reston, Virginia, the mauve-colored New Town (tm): Flashback Friday Monday: Everyone's a Winner! Flashback Friday Monday: Everyone's a Winner! A long time ago in a faraway place called Reston, before the Internets and the cable TV and the text messaging and whatnot, families used to gather around the fireplace in their earth-toned living room and play games together. Games like "The Game of Reston," which looks suspiciously like a certain trademarked game of real estate wheeling and dealing. But for a community founded on such lofty ideas as new urbanism and mauve, the Game of Reston (click image to enlarge) is a crassly commercial exercise in fundraising. Unlike other Monopoly knock-offs, which give, say, college alumni the chance to own their favorite dorms or pubs, the properties in this game are all local businesses, each with a business card-size advertisement. We guess someone might get excited about rolling double snake eyes and buy the Cameron Glen Care Center or Sir Speedy, but we'd rather own a piece of Reston Town Center or Wiehle Avenue. But what would the Park Place and Boardwalk of Reston be? What would be the cheap properties, a la Mediterranean Avenue? Discuss in the comments. For starters, Going to Jail is going before the DRB. The railroads would be the ever-reliable RIBS service. The utilities would be the RA and the RCC. Free Parking would be ... oh, hell. There would be no Free Parking. I think we all know the most prized property...the 'Reston Riviera' - Best Buy, Barnes & Noble, a great vast sea of parking. Just try to put up a house or a hotel, though. You'd be required to get the approval of all your neighbors, signed in triplicate. Also, you'd never be allowed to use those gaudy green and red plastic buildings. A piece of rotted wood or chipped stucco from the side of your house would work nicely, though. And imagine the Chance cards! "Lien on your property -- pay all players $25 or paint your trim mauve."